This valuable study resource provides a thorough, comprehensive review for the Certified Emergency Nurse (CEN) exam - and it's the only review book that also helps readers prepare for the Certified Flight Registered Nurse (CFRN) and Flight Paramedic Certification (FP-C) exams. No other resource provides both a review of content as well as over 1,400 questions and a CD-ROM with 3 practice tests. Each chapter features questions with answers and rationales for every question - explaining the "why" behind every answer. Packed with all the essential information needed for a complete review, it includes a new section on critical care, a new chapter on bioterrorism, and new content on conscious sedation issues, RSI, airway management, and safety training. The Transport section now includes new content on CAMTS standards and transport operations. Over 1,400 questions with rationales and references offer excellent preparation for the CEN, CFRN, and FP-C exams. A practice CD-ROM includes 3 sample exams with answers and rationales, and automatic grading helps users assess their mastery of the material. A content outline of must-know topics is provided, followed by practice questions, answers, rationales, and references. 1. 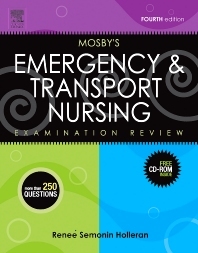 Emergency and transport nursing education and preparation for practice. 29. CAMTS Standards – NEW! 30. Transport Operations – NEW! Part 3: Critical Care Issues – NEW! 31. Invasive Interventions – NEW! 33. Invasive monitoring – NEW!